Download our 2017 Lent Guide and join us on this journey! I believe what Dostoyevsky was asserting is that beauty has a peculiar and mysterious power to stir us, to awaken us to the miracles of life and living. But life has a way of beating that wonder and awe out of us. For many of us we’ve grown cynical, bitter, and unavailable – which leaves us feeling like sleepwalkers, spectators at best in our own story. 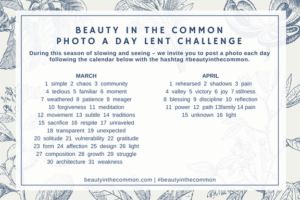 The aim of Beauty in the Common is to serve as a sort of liturgy of remembering, of slowing and seeing the depths and fullness of all that is around us. That fullness is seen, not only at the mountaintops, but also the mundane, everyday spaces of our lives. 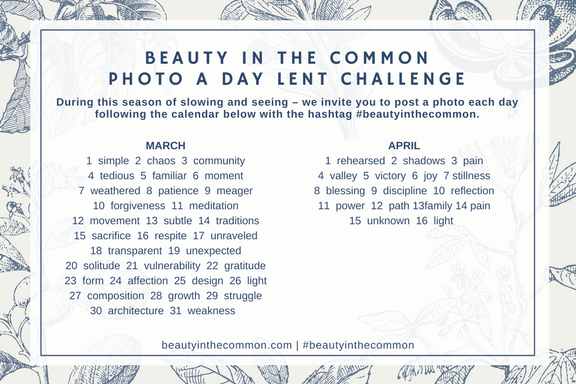 That is why we created this simple “Photo a Day” challenge for this season of Lent. Our hope is that during this season we’ll each become more of what Henri Nouwen calls “active contemplatives”, to “taste and see” more deeply (Ps. 34). So you’re invited! Invited to join this journey, to search each day for beauty that somehow speaks to the different corresponding words with the aim that each of us will pause, slow, and truly see the fullness of all that is around us. Posting your picture will help others (us included!) to experience that same depth. Once you’ve done that embolden a friend to join you! Our prayer is that – instead of hearing, “do more” we would be captivated and invited to “see more”, to stop skimming and glancing – to see fully the depths ; the divine presence in all that we do. May we create, share, design, dream, and be absorbed in these moments, these glimpses. May we see with new wonder the beauty in the common. I’m so glad you like it, friend!